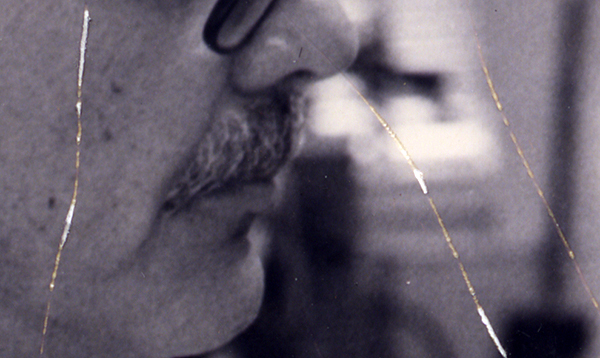 A restored photo of Larry Levis, circa 1993, appears in the Gallery of this issue of Blackbird. As soon as senior editor Mary Flinn brought the image in, the first thought from online editors, upon seeing multiple thumbtack holes and scratches, was to attempt restoration at the hands of our online editor and photographer, Scott Vickers. 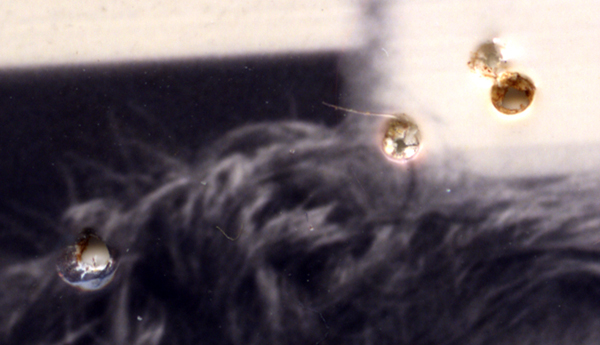 Flinn's take, however, was that we publish it as recieved—thumbtack holes, scratches, and all. 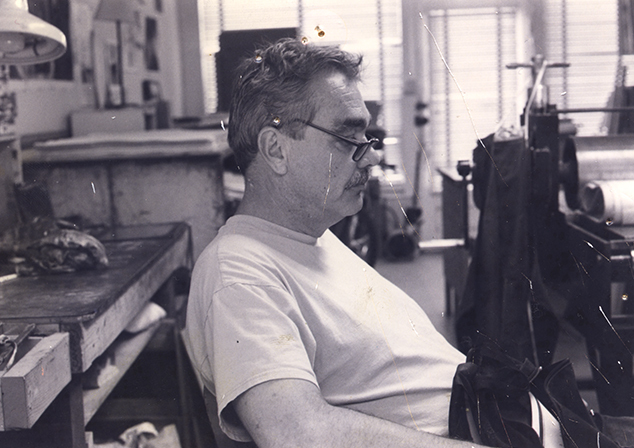 For her, the print was a piece of ephemera, a passing snapshot of Larry Levis by David Freed when Levis was visting Freed's studio. The material marks were indicators of its long history as an object posted to the bulletin board above her desk. Online editors at Blackbird make reference from time to time to the folklore that vampires, on encountering scattered seeds, or a bag of rice, are compelled to count every one; so too with our image and audio editors, who attempt to give the same attention to media that our copyeditors bring to alphabetic text. It follows that Vickers, given his photography background and editing predispositions, could not help but start with an assumption of restoration, and a treatment of the image as if it were an art photograph. Blackbird chose to publish Vickers' restoration and was confident enough in it to publish the image with a magnifier to let readers get in close, though we do not mention in the Gallery presentation (revealing it only now) the physical condition of the print from which we started. Below, find commentary from Flinn and Vickers, as well as an unrestored and restored version of the image for a side-by-side for comparison. Included in Flinn’s commentary is her snapshot of the bulletin board where the photograph of Larry Levis has been pinned for a decade or more. One day (probably around ten years ago) when I had stopped by David Freed’s studio to collect a copy of his small print portrait of Larry Levis (which for some years we were able to present to Levis Reading Prize winners as a keepsake), he noticed this small snapshot of Larry sitting on a surface and asked if I would like to have it. The snapshot was one of several taken when David was working on portraits of Larry in 1993. I said yes, and took it to my office, where I pinned it to my bulletin board. When the office moved to my home, the snapshot came with it and went back onto the bulletin board in its new location over my desk. Since that time, the cat has frequently entertained herself by knocking things off the board, so the photograph has collected a fair number of small holes from the various placements of the pushpins that secure it to the cork. 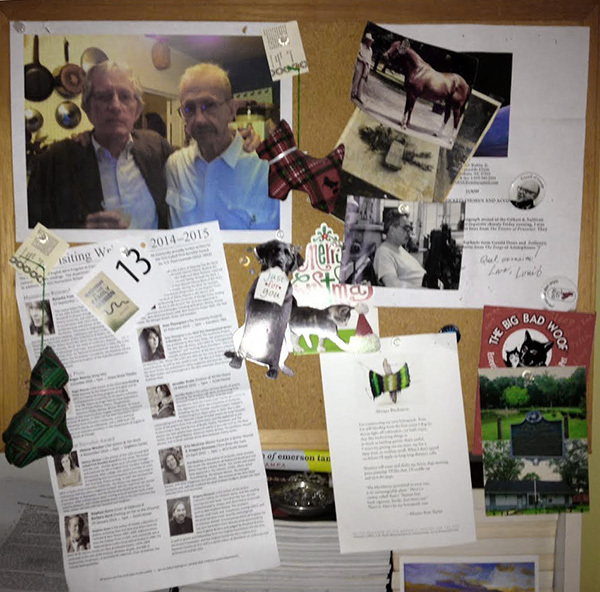 The little photo still sits on the board along with various and sundry other small mementos of writers and friends, a photograph of Secretariat, schedules, and Christmas ornaments representing a tartan dog and a calico cat. The editing and restoring of photographs (or audio pieces, for that matter) is like cleaning a dirty window in a long-abandoned house. First, there is the cleaning of the glass itself, which once done, might reveal that the casings and frames need painting; once that’s done, the view through the window will be clearer, perhaps making the viewer realize that the yard needs desperate work, or back inside, that the painting alone won’t be enough, and some curtains and perhaps shades will be required as well. I first fix the most obvious, easily seen flaws, such as the scratches and pin holes, though there might be some preparatory work (akin to taping off a windows woodwork), such as adjusting the overall color of an image, perhaps even well past the point I know I’ll use in the final work. The extreme adjustment can reveal problems, especially material damages like scratches, or anything that is actually cut into the paper itself. After those marks are removed, I walk away from the picture so that I can return to it with fresh eyes and double check my work. Is an edit visible? If it is visible, is it less destructive than what was there before? And if at all possible, I’ll pull others aside and get their first impressions; often they will immediately see something obvious I’ve missed. After all the major work is done, then the photograph reveals itself. By removing the surface defects, I allow the eye to see through to the picture again, to the photographer’s original intent and impulse.